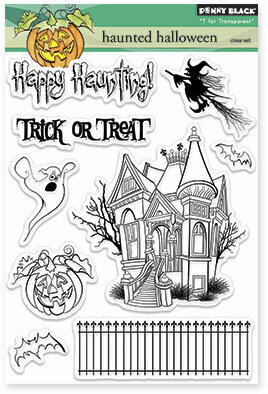 Penny Black clear stamps featuring a haunted house, a witch, a bat, a ghost, a pumpkin, "Trick or Treat", and "Happy Haunting". Create a bat with wings that flap up and down with this new addition to our Flutters line! Includes stamps and dies for bat, wings, hat, and spider, and a set of 10 brads to get you started. "I'm simply batty for you". Instructions included. Halloween Cling Stamp from Impression Obsession featuring the phrase "trick or treat, smell my feet, give me something good to eat!" 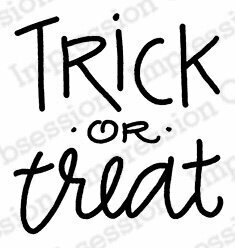 Halloween themed cling stamp from Impression Obsession featuring the phrase "Trick or Treat". Skeletal hands grab for all the candy on Halloween. Image measures approximately 4" X 5-1/4". This original design by Fran Seiford is deeply etched and precision cut from premium gray rubber on a 1/8" gray rubber foam backing then mounted on a cling vinyl decal with full sized image for easier storage and use with an acrylic handle sold separately. Technique Tuesday clear stamps featuring Halloween themed planner elements. 19 clear stamps on a 2" x 4" storage sheet. Made in the USA using the highest-quality photopolymer. This Halloween themed stamp set from Art Impressions features a woman in a pumpkin costume. Halloween themed Art Impressions stamp featuring the words "Trick or treat!"